YFC Ski 2020 will be designed to meet all your needs when hitting the slops with your YFC friends! *Please note these options have additional costs. For more information please visit the NUCO booking page. ** Learn to Ski or Board with YFC – YFC Ski is brilliant for novice skiers and snowboarders as you can learn on the trip! Plenty of lessons on offer and the chance to learn in a supportive environment with other Young Farmers. To book the full package, please follow this link to the NUCO Booking page. If you want to join YFC in resort but plan to manage your own accomodation and travel, you can purchase a wristband only package. I have been snowboarding since I was 15 (which was a long time ago!). This is my 8th YFC Ski trip and I am really looking forward to returning to Val Thorens – everyone is going to have a great time. If you have any questions about the trip do get in touch. YFC Ski 2017 is going to be my 2nd year as the South West Area Ski Rep. This is an amazing ski trip and I've met many YFC members from across the country.! Having skied on and off before, the YFC Ski trip certainly got me back on my skis and by the end of the week I was on the black slopes! This is definitely a YFC highlight of the year in my opinion and certainly a date for the diary. Roll on YFC Ski 2017. I’ve never skied before. Can I book on the trip? I’ve never skied before. Can I book on the trip? Absolutely - lots of people who come on YFC Ski have never skied before! The good news is that this year’s trip to Val Thorens is perfect for you. The terrain is suitable for everyone from beginner to expert and you will have great fun on the mountain. If you are still a bit nervous you can book some lessons on the NUCO booking page when you reserve your place (2 hours a day, for three days is the bargain price of £79). I’ve been skiing for years. Is this trip suitable for me? I’ve been skiing for years. Is this trip suitable for me? The joy of YFC Ski is you can choose exactly what you want to do. The resort has an abundance of black runs and parks (including the famous DC Park in Meribel) so whilst some Young Farmers are learning to stand upright on their skis you can go off-piste to your heart’s content. 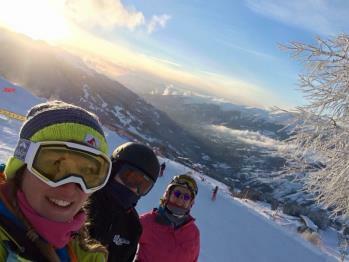 You certainly can – even Supermoo has been snowboarding on a YFC Ski trip! What can I do in the evening? What can I do in the evening? After the lifts have closed and it’s just you up the mountain, the party can begin. 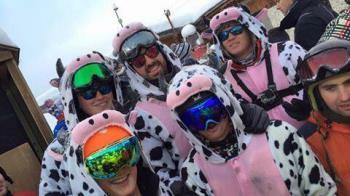 You can sample some of the amazing Après that Val Thorens has to offer either with a group of friends or alternatively you can join in with the fun NUCO has planned – whether that be the comedy night, mountain meal, welcome party or adventures around the many bars. I don’t own any ski equipment. Do I have to buy everything? I don’t own any ski equipment. Do I have to buy everything? Buying ski clothing can be expensive so NUCO has partnered up with Crevasse Clothing to offer you a range of great deals. Costs start from £29 to £69. Clothing can be ordered at the same time as you reserve your place on the NUCO booking page. Do I have to have travel insurance? Do I have to have travel insurance? Yes. For your own protection, NFYFC insists that you have appropriate travel insurance in place. This can be brought as part of your booking with NUCO or alternatively you are free to shop around and buy a policy separately. What do I do if I want to hire performance/latest season skis? What do I do if I want to hire performance/latest season skis? Never fear! NUCO can provide you with a choice of equipment from the most basic (ideal for beginners) to precision technology. This can be ordered at the same time as you reserve your place on the NUCO booking page. I can’t find how to book on the NUCO website – what do I do? I can’t find how to book on the NUCO website – what do I do? Can I do a group booking for my YFC? Can I do a group booking for my YFC? The way YFC Ski works is that YFC members have to all individually book their space. However, once all reservations are in there is then the opportunity to create friendship groups on the website. As a group you can request accommodation together, allocate rooms to certain people etc. For further information about this process please speak to your local ski rep.
My friend and I want to book together –is this possible? My friend and I want to book together –is this possible? You will both initially have to book separately. Once all reservations are in there will be the opportunity to request the same accommodation. For further information about this process please speak to your local ski rep. I don’t know anyone else who is going – is this trip suitable for me? I don’t know anyone else who is going – is this trip suitable for me? Never fear – YFC Ski is only available to YFC members so you will be surrounded by people who have similar interests to you. NUCO will also be organising a range of trips and activities throughout the week so you will definitely not be on your own for long. If you still have concerns please do speak to your local ski rep who will reassure you that you will have the time of your life!